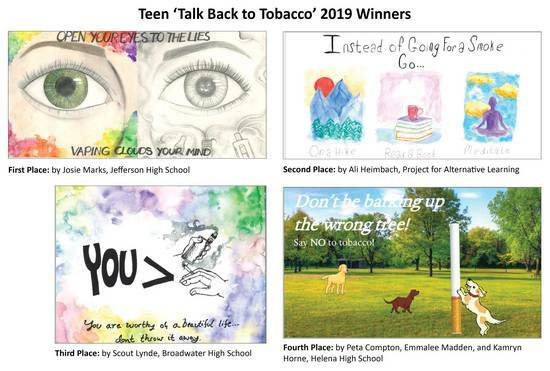 Teens from three counties have shared their thoughts about the dangers of tobacco through a billboard design contest sponsored by Lewis and Clark Public Health. The contest winner was Josie Marks, from Jefferson High School. Second place was Ali Heimbach from the Project for Alternative Learning. Scout Lynde from Broadwater High School got third place, while Peta Compton, Emmalee Madden, and Kamryn Horne from Helena High School won fourth. Thirty middle and high school students from Lewis and Clark, Jefferson, and Broadwater counties participated. Marks’s first-place design will appear on a billboard on the east side of East Helena for eight weeks starting March 4. Heimbach’s second place design will be posted on the west side of Helena for four weeks. The winning designs target the tobacco industry’s deceptive marketing toward youth. The first-prize entry encouraged youth not to be fooled by the “lies” of big tobacco. 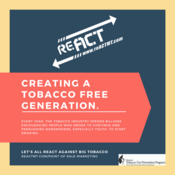 The event was funded with a grant from reACT, a Montana youth-led movement to motivate students to take a stand against “Big Tobacco.” reACT stands for React Against Corporate Tobacco. Hooking a New Generation. Big Tobacco is trying to create a new generation of tobacco addicts by targeting their advertising at young people. They know that 90 percent of tobacco users start before the age of 18. Tobacco companies spend $1 million an hour advertising their products. Since they can't advertise cigarettes on TV, they spend 95 percent of their advertising budget in the stores that sell their products -- like gas stations, convenience stores, pharmacies, and grocery stores. This is called Point of Sale advertising. Some of their tactics include price discounts, colors, and flavors. Candy Flavors. 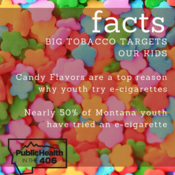 Big Tobacco makes products that look and taste like candy -- with flavors like fruit punch, strawberry milkshake, and blue raspberry -- because they know young people will be tempted to try them. In fact, flavors are one of the primary reasons why youth start using tobacco products. According to the Truth Campaign, about 8 out of 10 tobacco users aged 12 to 17 reported that the first product they used was flavored. Product Placement. When you walk into a gas station, convenience store, pharmacy, or grocery store, have you noticed all the tobacco marketing around you? This tactic includes placing products on the counter and near candy. Signs and ads are often placed at eye-level for children: on counters lower than 4 feet. The cigarette industry spends $726 million ayear on product placement, while the smokeless tobacco industry spends $64 million (U.S. Surgeon General Report: Preventing Tobacco Use among Youth and Young Adults, 2012 ). Counter Tobacco describes how Big Tobacco spends most of its money marketing products in the retail location. 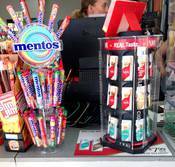 Placing tobacco products next to candy makes them more visible and appealing to youth. Price Discounts. Have you ever looked around the store and seen buy-one-get-one discounts for tobacco products? How about coupons? According to the Truth Campaign, “The tobacco industry spent over $7 billion on price discounts and coupons for cigarettes in 2014—its largest marketing expenditure that year.” Lowering the price of tobacco products makes them more affordable for youth to begin using. A 2012 Surgeon General report concluded that “the industry’s extensive use of price-reducing promotions has led to higher rates of tobacco use among young people than would have occurred in the absence of these promotions.” Coupons, discounts, and other price-reducing promotions make it easier for youth to access and afford tobacco products. Packaging Colors. 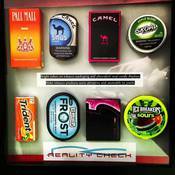 Tobacco products packaged in bright, neon colors are another point-of-sale tactic Big Tobacco employs. The colors make tobacco products look harmless, like gum and candy. Tobacco marketers know that the bright packaging will attract the attention of young people. You can learn more about how color influences the marketing and buying of tobacco products in this research paper. Unfortunately They Work. Colors, flavors, price discounts, product placement -- unfortunately these point-of-sale tactics work to hook youth on tobacco products. A 2010 study reported in the journal Pediatrics found that teens are twice as likely to start smoking if they visit a store with point-of-sale tobacco advertising at least twice a week. 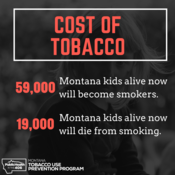 Visit the Montana Tobacco Use Prevention Program, the Campaign for Tobacco Free Kids, the Truth Campaign, or the Centers for Disease Control and Prevention for accurate and up-to-date information about the health hazards of tobacco use. If you have questions about the local impact, contact Sarah at Lewis and Clark Public Health. The mission of the Lewis and Clark Tobacco Use Prevention Program is to address the public health crisis caused by the use of all forms of tobacco. Promote quitting among adults and youth. Build community support and capacity for tobacco use prevention. Residents of Lewis and Clark and Broadwater Counties.